The Complete Fisher Forum :: View topic - Venue Review - Avington Trout fishery. Posted: Mon Mar 17, 2008 12:50 pm Post subject: Venue Review - Avington Trout fishery. Avington is perhaps the best known name in small stillwater stalking. the lakes, and scenery are as good as you will get anywhere with clear water, luxuriant weed growth and good bankside keeping. Its held many records, and there's always the sense of history as you turn up to fish. Lake 1 is long, thin, and fishes better at the far end from the lodge. Lake 3 has a deep channel along the Right side, and a deep hole at the closest end. this is where to fish. It's not cheap at Avington, and in my opinion, its going through a transition phase. my last few visits have seen small fish of a uniform size and little to stalk. that said, there are always a few biggies in there if you can find them. PBs at Avington are 18lb 4 for rainbow, and 5lb for browns. Nice review about a lovely place steeped in history. You are absolutely right to write with caution because of the current owner's insistance of stocking low sized fish and still taking high entry level money. I haven't been for eighteen months and won't be going back while the present owner is in charge. 33 doubles a year are stocked for the magazines. That is three for each month bar December when they say they have not had many anglers. Another good review Alex, thanks! I've fished Avington once but didn't have any fish in the bag that would make me pay that price to fish there again. Interesting posts from you and Myangle reflecting my findings exactly. Avington is a wonderful place but the last few times ive fished it there's been one double in each lake with fairly small stockies. I hope it comes back into it's best form soon, because it's a lovely place to fish. I doubt I will ever go there much as I like clear water fishing, �70.50 for four fish that are averaging 3-4lb is taking the piss. Amazing this place is still trading on past glories and getting away with it. Just my opinion of course. If you want a big fish water around the home counties then I think Lechlade is your best bet. 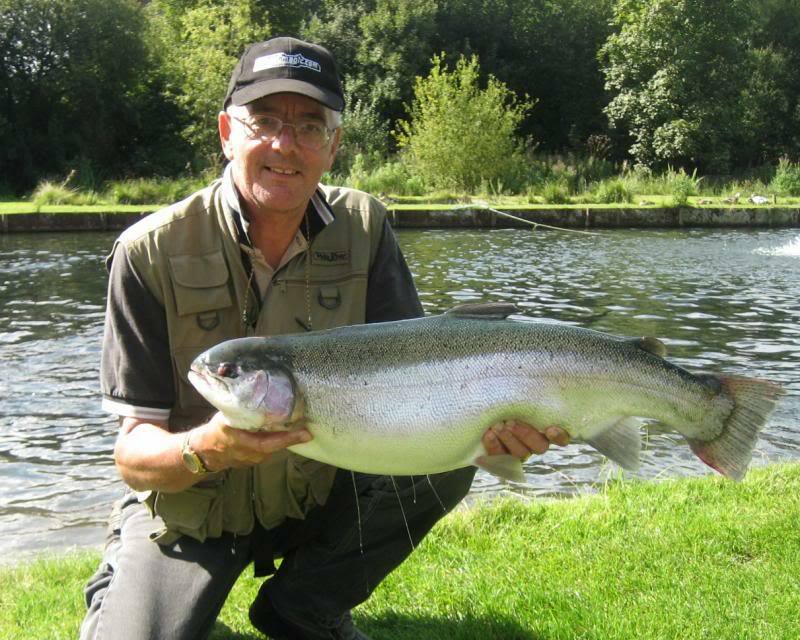 You can 'expect' the fish you get from Lechlade to be at least 7lb+ and it's not uncommon to see a bag of four fish over 10lb each. They also put up a great scrap and taste very good. Totally agree. I was up there last weekend, and had 4 from the boat. they were 7lb 8oz, 9lb, 10lb 8oz and 11lb the 10.8 was one of the hardest fights ive had for years, on an 8 weight Bloke rod as well! it bored over and over into the depths, and just would not give up.! one of those fish i REALLY wanted to release after the fight it had given! the lllb was a blue as well, and fought almost as hard. Went with a beginner who had a fish chase his fly first cast that must have been all of 18lb. turned away at the last second when it saw the boat, but left him with a memory he'll never forget.! He also got his first double at 11lb 12oz. Posted: Fri Sep 11, 2009 11:57 pm Post subject: Re: Venue Review - Avington Trout fishery. This is my first post on this Forum. Hope you don't mind an update on Avington. I've fished it regularly throughout July and August 2009. I certainly understand Avington has taken a lot of criticism over the past few years and it's past glory was severely undermined. However, in my opinion, that has now changed and very much for the good. Facilities are excellent, staff are superb and the fish are of excellent quality and average size. The three lakes remain crystal clear and even temperature throughout (occassional algae bloom in really hot weather). The top third of the top lake is fenced off as the owner is building a residence at the top end. Mornings are definately "easier" with GH Damsels, flashy marabous and similar all catching. Typically by the afternoon, small nymphs and buzzers work better. On each of my visits I have always managed to locate some big fish. The reports suggest between 10 and 25 big doubles are landed each month - I suggest there are more to be found! You may get lucky but stalking and being very selective is without doubt the best option for these big fish. A certain mindset is also required to "ignore" the 6lb+ stockies! Just in case anybody wonders, I have no affiliation to Avington, just an ancient history and fond memories going back to the Sam Holland days! Neil, welcome to the Forum. One question...what the hell do you do with all that fish? Thanks for your update on Avington it sounds as if they may be turning themselves around at last. I'm not over keen on eating trout but donate/give away most of the ones I keep (I prefer C&R where possible). However, a couple of those big ones have been cold smoked by a friend, the rainbow and brown tasted very nice indeed!